Ok so I got to the GAP last night and I was looking at all the new products we got for our Fall 1 collection. So they have come out with some interesting things since I have been working there. I freaked out when they sent us leggings to go under skirts. Lauren my pretty you do look hot in them I must say, but there are some ladies out there that think they can wear them with a big shirt over them. THIS IS NOT OK!! Back to last night Jason decided to show me the new "Limited Edition" Jeans we got. THEY FREAKING HAVE ZIPPERS ON THE LEGS. Ok we are not in the 80's and we are not GUESS. I was in such shock by this I had to walk around and show EVERYONE. Why why would you think that women will want to buy these. They went out of style like what almost 28 years ago they went out of style because they needed to. GAP don't bring them back we let them go for a reason. 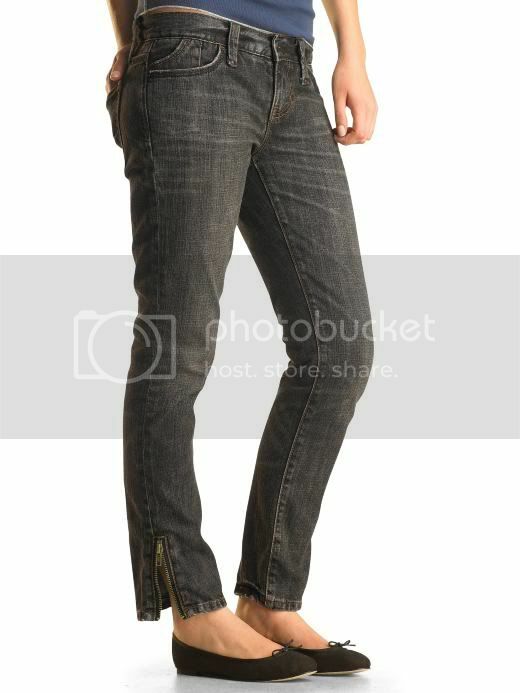 Oh yeah and the come in 2 different colors, black and denim. Here is a picture of them. I know you all want them. Do they come in maternity? Those are awesome - I need them in both colors! I'm scared of 80's fashions.